Aerial photography / cinematography, topography mapping, drone surveys & aerial inspections, for digital media and construction industry. Sunset over Internet City & Al Barsha Heights, Dubai. Click to view Drone Photographs Gallery. Drone Surveys & Aerial Mapping. Aerial 3D scanning of buildings. Real Estate Photography & Interiors. 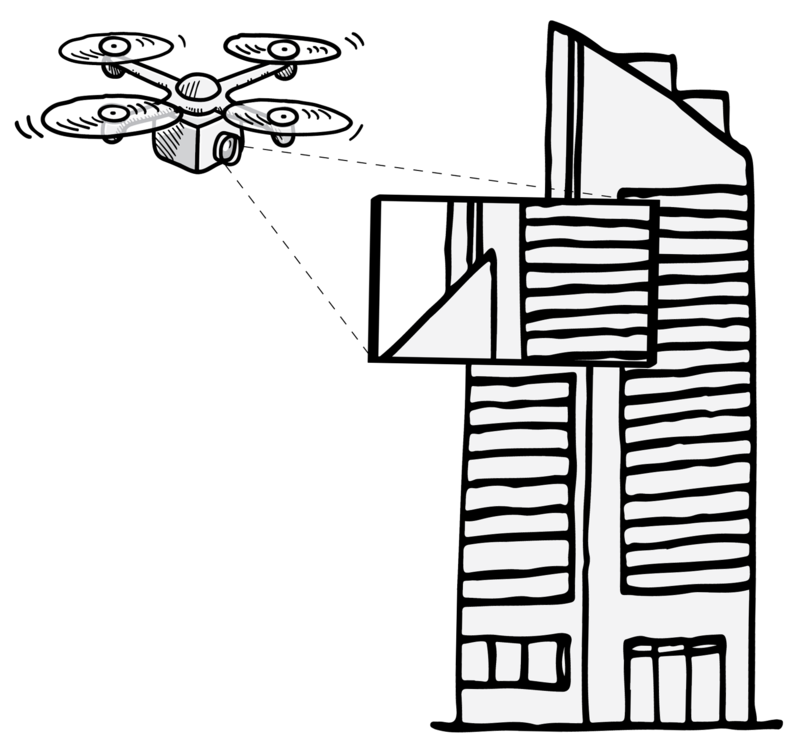 Flat Vertical, Aerial Imaging and Data Acquisition, is a web front end to Atif Abu-Samra FZE. The firm was first set up in 2011 by A. Abu-Samra MEng CEng MIStructE. At the start, the core of our business was photo and film/video production in the UAE and for the clients abroad. In response to a growing demand, we grew the list of our services to offer aerial works to our clients. This freed a new path for us in the media industry, as well as architecture, construction and civil works sectors. Our services now include aerial photography and aerial filming; aerial surveys, inspections, aerial mapping and 3D scans of buildings. We use advancing unmanned aerial technologies to carry out aerial projects. See sections below to find out more about each of the services we provide. The UAS/drone industry is diverse, innovative and international. It has an enormous potential for growth with the associated possibility to create jobs. To ensure a safe, secure and environmentally friendly development, and to respect the citizens’ legitimate concerns for privacy and data protection, GCAA has developed a regulatory framework for UAS/drone operations in the UAE. We plan, organise and carry out remotely operated unmanned drone flights. Our aim is to capture some of the most stunning aerial photographs, to give you and your projects an additional edge. We can secure all the approvals and licenses required for photography – or filming – so you won’t have to worry about that. Whether you are an architectural or an engineering firm, or a fashion brand, we can cater for your needs. All aerial photos and film we take can be captured in raw format, if and when needed. This gives us the highest dynamic range and maximum flexibility during the post production phase. As a result, we can provide you with high quality still photos and motion footage. But technical aspect is not our one and sole focus. With our experience in the field of commercial photography, we do have the knowhow and the skill to organise and execute a project. But in addition to that, we believe we also have an eye and a feel for what makes a good image. If you create media content; if you are a real estate agent, a film producer or simply someone who needs high quality footage captured from air, we can help. Our drones can record film footage in many formats. These include Apple ProRes 4444 and a 12-bit Cinema DNG raw format, with close to 13 stops of dynamic range. This is something that you or your post production studio will surely appreciate. To learn more about the formats in which we can currently record photos and film footage, please read our Video and Photo Formats info page. You can call us directly to discuss, or write to us using the contact form below, if that’s easier for you. Here is a link to aerial footage and drone video samples. Real Estate Aerial Photographs / Interiors Photography and 3D Virtual Tours. In addition to aerial photography we provide, we also carry out “ground level” photography of interior spaces. Our aim is to give you a full set of images that show off your development in the best possible light. No pun intended. In addition, via our network of skilled suppliers, we can offer to create 3D walk-through virtual tours of your property. You can then use all of these visuals to promote your property. If you are in the real estate business, then you are already aware that a large portion of buyers do their initial research online. Their first encounter with your property on offer or your development will be the images that they see on your website. Or what they see on your online presentation or brochure. We personally believe that the first impressions are essential. Feel free to contact us for more information. Or call us to discuss how we can best help you create visually impressive images of your real estate. Aerial Mapping, Surveys and Volumetric Change Analysis. Aerial mapping is an added part of the services we provide. In contrast to a common land survey, an aerial survey can cover the chosen area in great detail. We program our drone to carry out an autonomous flight over an area. To capture high quality photos and record GPS flight data. Photogrammetry techniques are then applied to create a dense 3D point cloud. 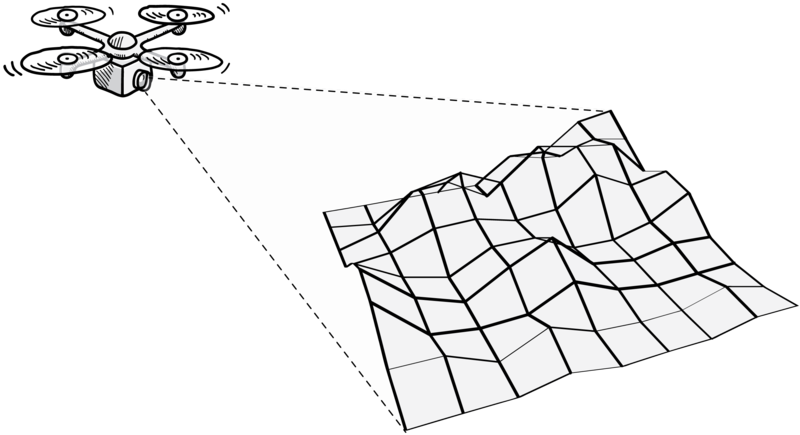 In turn, a 3D topography model is derived. With this information in hand, we can monitor the progress of works on a site. Or, we can calculate surface and volumetric changes of stock piles, excavation quantities, etc. The 3D models we create can also be textured and used for visualisation. For more information, or to discuss particular needs of your project, feel free to contact us. 3D Scans of Buildings and Large Objects. As a part of our aerial services, we fly missions to scan buildings and convert them into a 3D model. The drone captures overlapping images at defined points around the object. From those, we develop a dense 3D point cloud and, in turn, a 3D mesh. Usually, the photos taken are then used as a texture map for the 3D model. The model can then be exported to a correct format for further use in software applications. Common use includes Building Information Management (BIM) software, like Revit; or software for 3D modelling, manipulation and 3D rendering. Examples include 3D Max, Maya, Fusion and Rhino. Contact us to find out more, or to discuss particular needs of your project. As a part of our photo and video production, we often apply for location permits to shoot and film for a wide range of clients. We are registered with Dubai Film and TV Commission, which allows us to do so. And, we are also registered with key civil aviation authorities in the UAE. We can freely liaise with them to apply for NOCs and UAE Ministry of Defence (MOD) security checks and clearances. We can readily seek any other permits for photo shoots, filming or aerial work, should this come to be needed. For more details related to filming and aerial permits in the UAE, feel free to call us to discuss. Souq Al Bahar & Down Town Area, Dubai. Click to see aerial photos gallery. Trained and Certified Drone Operators/Pilots. Our remote pilots are trained under a Commercial Level Multi Rotor RPAS Certification scheme. And they are certified for commercial UAS/drone operations in the UAE. We are registered with the General Civil Aviation Authority (GCAA) for work across the UAE. We are also registered as a commercial drone/RPAS operator with Dubai Civil Aviation Authority (DCAA). DCAA has an extra set of rules for those who carry out drone work in Dubai. In 2017, hefty fines were introduced for those who carry out drone works without appropriate certificates and registrations. Talented eye for a good image. We were involved with both non-commercial and commercial side of photography and cinematography for many a long year now. And so, we believe that we have the right talent and a trained eye to create beautiful stills and images in motion. We say that not only from a composition and lighting point of view. But we state that with an understanding that images need to help tell (and sell) a story. The drones we use are rigged with a 21 megapixel sensor to capture photos in a 12 bit DNG raw format. It can also record film footage in a 12 bit Cinema DNG raw format, with close to 13 stops of dynamic range. The media captured in raw gives more flexibility in post production, be it photo retouching or film colour grading. It also ends up looking better on the screen or in print. For some, the downside of having media in raw format is that the file size tends to be larger. Also, more processing power is needed on the post production side of things. Nonetheless, for those used to a professional workflow, this is a perfect solution. For a full list of formats our drones can record in, please see our Video and Photo Formats Additional Info page. Under this heading, we felt it was inappropriate to brag. But, when we get a chance to work together, you’ll let us know what you think. Deal? Commitment to Health & Safety. For most people, flying a drone is a fun activity. And we think it really is! However, if not approached aptly, it can also be a risky one. It can cause damage to property. And it can also cause severe injury to human life. With all our aerial/drone operations, whether they be a commercial photography project, an aerial survey or a drone inspection, we take the issue of health and safety seriously. When assessing potential risks and hazards we try to find methods to eliminate them. If a risk cannot be fully removed, we look for and decide upon the most appropriate mitigation measures. For each project, we carry out a task specific risk assessment. This ensures that on the day of the flight, we are suitably prepared. And that our crew is ready for any foreseeable eventuality. Despite our health and safety policies and our no accident record, we know that accidents may occur due to factors beyond anyone’s control. With this in mind, we are insured against public liability up to a value of USD 1 million. We feel this is more than enough to keep us guarded, for our own benefit as well as the peace of mind for our clients. One stop full production service. Based upon the type of your project, we can offer a complete, one stop production service. We’ll take care of approvals, location permits, talent, flight crew, post production, data processing – the whole lot. With our knowledge and experience, we are able to plan, schedule and manage the project, to hit all milestones. To deliver the project to you on time and in line with your projects’ specifications. Still, if you just need our input with only a specific part of your project, we’d gladly offer our help as a third party supplier. Before, you’d have to hire a helicopter to get some decent aerials. And, there was no guarantee that you’d get the exact angle you hoped for. Now, with drones being so versatile, you can position your camera in the sky exactly where you want it. You can compose your shot exactly how you want it. And, you can do all of that at whatever time of day you’d need for those beautifully lit shots. It’s just awesome! What is an UAS / UAV / RPAS? UAS stands for an Unmanned Aerial System. It is an unmanned aircraft, operated without any direct human intervention from within the aircraft. Sometimes, you will also see it written as UAV. This stands for an Unmanned Aerial Vehicle. Or, you may have heard it being called an RPAS, which stands for a Remotely Piloted Aircraft System. And you have, no doubt, heard it being called a drone. Essentially, many use these terms interchangeably to refer to the same thing. Our additional info page lists other commonly used terms, expressions, acronyms and abbreviations used within the industry. Can I fly a drone as a hobbyist? 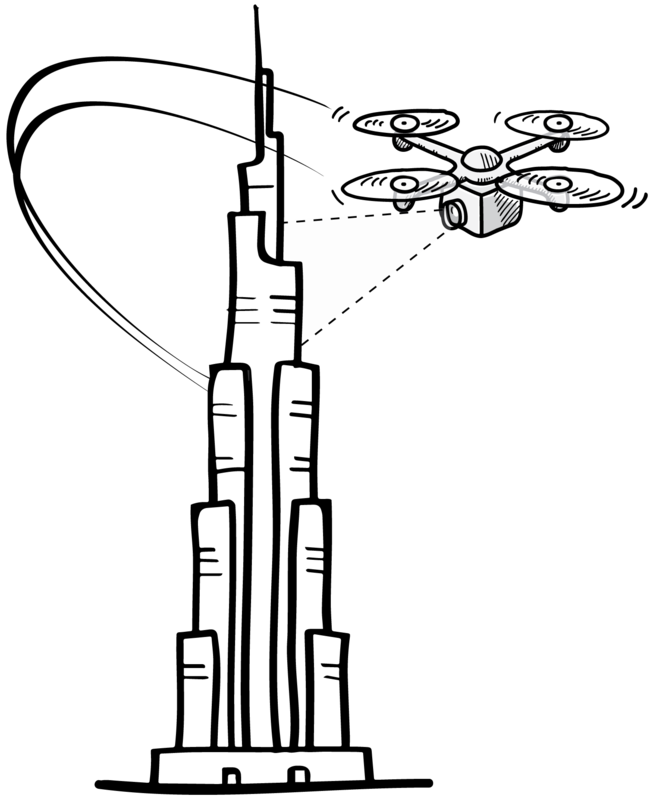 In the UAE, all drones heavier than 500g need to be registered with the GCAA. And, if you intend to fly your drone in Dubai, you will also need to register it with Dubai Civil Aviation Authority (DCAA). Before they approve you, DCAA will want to see your RPAS training certificate. 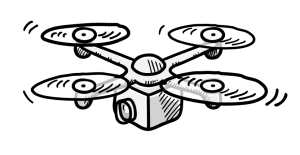 Note that, for hobbyists, current Civil Aviation Regulations (CARs) forbid use of drones with image recording equipment. If you have a drone, and you intend to fly it for recreation, make sure that your drone is registered and that you are familiar with the latest regulations. Word of mouth advice you hear on the street will not protect you from potential charges and fines. When flying, use common sense. Flying a drone, although fun, can cause severe injury or damage to property should things go wrong. A copy of current CARs can be found on GCAA’s website. Do you run UAS training / certification courses? No, we do not. However, at present there are a few centres in Dubai that do so. And the number of these centres is likely to grow. For UAS/RPAS training and certification courses you can contact Exponent Technologies, located near Al Maktoum World Central Airport. How long can a drone stay up in the air? The drones we use can stay up in the air between 15 to 30 minutes. That’s in a single flight. The actual time depends on the drone itself, the weight it carries, the demands of the mission and complexity of the maneuvers, and the weather conditions. It is often the case that drones are intermittently landed for their batteries to be replaced before taking off again to complete the mission. No. We do not rent our drones. Our drones can only be flown by operators specifically registered for their use. However, perhaps we can help you in some other way. Why not give us a call with your specific requirements and together we can figure it out? What permissions do we need to get for an aerial photography or aerial filming project? NOC from the General Civil Aviation Authority. NOC from the local Civil Aviation Authority. If you are filming in Dubai, then it would be the DCAA. If you are filming in Fujairah, then it would be FDCA, and so on. Security clearance from the Ministry of Defence. Filming permit from the relevant authority, e.g. DFTC in Dubai, or Abu Dhabi Film Commission in Abu Dhabi. Note that you will have had to have been registered with relevant authorities before you can apply for the above. So if that is an issue for you, we can assist. We can secure all of NOCs, security approvals and filming permits. Or anything else that may be needed to keep the project moving. We would need you to provide us with certain documents relating to your business or the intended activity. Normally, these would include copies of IDs, creative briefs, filming script, letter of undertaking, etc. One thing to keep in mind is the time it takes to obtain all the necessary permits. Usual turn around time ranges from 7 – 10 working days. This often depends upon the location, the main authority in charge and the time of the year. If you need additional information, feel free to get in touch with us and we can advise accordingly. How long does it take to get a filming permit in Dubai? In Dubai, a filming permit from DFTC takes between 3 – 5 working days to process. For each of the above transactions, you will be asked to pay AED10 Knowledge Fee and AED10 Innovation Fee. These are charged by the local government. So in total, a permit for filming or photography at a public location in Dubai will cost you AED3,040. What's the length of video footage you can record? Well, let’s look at it this way. A single flight lasts between 15 – 30 minutes. Our drones carry a single 480Gb SSD drive. So the answer will be anywhere between whatever can fit on the drive and up to a maximum of 30 minutes in length. But that doesn’t really answer the question. Does it? More to the point though, the length of the recorded footage will depend on a number of factors. These include the capture resolution, video compression rate, video frame rate and camera’s dynamic range. As an example, a 4K film recorded at 30fps in H264 (data rate: 100Mbps), would be over 20 times longer than the same footage recorded at 30fps in Cinema DNG raw (data rate: 2.4Gbps). In real terms, a single 480Gb card would fit close to 12 hours of H264 footage and 30 minutes of footage recorded in a Cinema DNG format. Thankfully, we are not limited to a single flight. And, generally, a number of flights are needed to achieve project’s objectives. So in reality, we are not limited by the amount of storage a drone carries. So we can provide you with as much footage as you think you need. Do your services include post production? Yes, they can do. Although we would need to agree this in advance, so that we know how to plan the project. For videos, based on your needs, we can either string all the footage together onto a single timeline. We can colour grade it in DaVinci Resolve, before submitting it to you for review. If we are working towards an agreed creative brief, we can edit all the aerial footage, and any other footage recorded for the project. We can do that in a way that complements the story you are trying to convey. Or, we can do it in accordance with your Film Director’s or Cinematographer’s vision. We can also provide you with original score music, should this be required. For stills photography, we can retouch images to suit a diverse set of needs, from minor colour corrections to high end composite retouching. Please call us to enquire. Orthomosaic Aerial Map: Kalemegdan, Serbia. Click to see more aerial maps. Sunrise over a golf course, UAE. Click to view aerial photographs gallery.